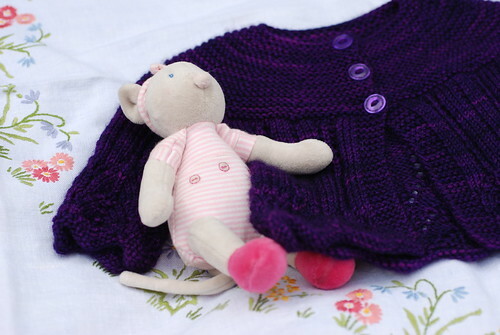 First up, a Baby Surprise Jacket – finished! 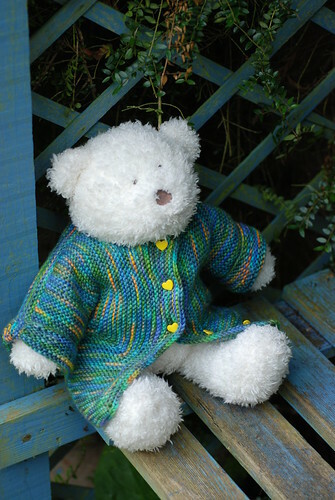 My actual genuine went-to-the-olympics knitting, as modelled by a friendly bear. Well it’s finished now, but that doesn’t quite count. It’s a Baby Mine in the gorgeous Cephalopod Yarns Traveller, and I finished it on Tuesday. I was nearly nearly there, and if the Closing Ceremonies had lasted as long as the Opening Ceremony (and I hadn’t fallen asleep) I might just have made it. Congratulations to you both, that looks to be a perfect excuse for the occasional nap. Congratulations – can I feel smug I knew already? Looking forward to the cold weather so we can see what him/her!